Vollrath 52870 Black Melamine Round Serving Bowl 34 oz. TigerChef > Dinnerware > Melamine Dinnerware > Melamine Serveware > Melamine Bowls >< Melamine Serving Bowls > Vollrath 52870 Black Melamine Round Serving Bowl 34 oz. $42.99 Thunder Group 5108J Wei Noodle Bowl 34 oz. $34.99 Thunder Group 5108TW Imperial White Melamine Deep Bowl 34 oz. $55.99 Thunder Group 5275J Wei Asian Curved Noodle Bowl 34 oz. $45.99 Thunder Group 5275TW Imperial White Melamine Scalloped Bowl 34 oz. 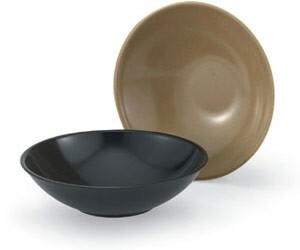 Perfect for restaurants and catered events, the Vollrath 52870 Black Melamine Round Serving Bowl 34 oz. is ideal for serving specialty soups, stews, and more. The simple yet timeless black finish of this dinnerware piece beautifully frames food and highlights its colors and textures. Combining the delicate look of china and the exceptional durability of melamine, this high quality product is impact resistant and withstands heat up to 187°F. A must-have in any fast-paced commercial food venue, this serving bowl is dishwasher safe, making cleanup a breeze.